"The Man Who Stole the Sun"
"The Man Who Bossed Superman"
This comic was originally printed in 1953, right around the time that 3D images were becoming popular. Making pictures three dimensional with the help of the familiar red and blue lens glasses is relatively easy to do, yet difficult to do well. Unfortunately some of the text is supposed to be 3D as well, but instead is often illegible with or without 3D glasses. Wearing the glasses for an extended period of time can give you a headache, but the 3D text will make it worse. Oddly enough, only certain word bubbles have the 3D lettering and there's no rhyme or reason as to which ones will have depth and which ones won't. If you can get past all that, the book is still enjoyable, especially the second and third stories. Main Story - "The Man Who Stole the Sun"
Lois and Clark were covering a science convention when a rocket-arrow shattered the window. Springing into action as Superman, he caught the rocket, which delivered a message from Lex Luthor claiming he had stolen the Sun and would return at the price... of liberty. Superman quickly dug a large hole, creating an underground city for the citizens of Metropolis to live in while he fought Luthor. Just then a beam from the sky destroyed the underground city and another rocket-arrow hit Superman, leaving a message that Luthor would turn Metropolis to dust. Luthor's heat ray was fired at the ocean, and a tidal wave rushed toward the city. Superman picked up an entire mountain range and dropped it on the shoreline, protecting the city. Luthor then appeared to Superman saying that he wanted the U.S. turned over to him before he left in a rocket. After takeoff, Luthor turned around and noticed Lois Lane behind his chair. She said she wanted to get a story. Superman set the rocket-arrow to fly back to Luthor while he followed. He realized that the Sun wasn't actually gone, just covered up by an invisible force-barrier of compressed atoms. Superman destroyed Luthor's heat ray, but Lex took off in the rocket again saying he wouldn't let Superman take him alive, and he'd take Lois with him. Superman punched a hole in the side of the rocket, which also hit Luthor in the face, knocking him unconscious. In the last panel, a woman, presumably Lucy Lane, was at the beach with Lois and said, "Isn't the Sun hot?" Lois replied, "It sure is. I wish it'd disappear." And that's where the hilarity ended. Story - 2: There are a lot of quaint stories in the Golden Age. Some of them work beautifully and others not so much. This one was incredibly fast paced, but still ridiculous. If I, as the reader, can't force myself to buy into the psuedo-science, even on a 1950's sci-fi level, then it's too much to expect of anyone else over the age of seven. The story suffers mostly from being told too fast with little or no explanation or breadth of action. There was a lot less text than what one might normally expect from a comic before the 1970's. The silliest part was when Superman constructed the underground city and planned to do the same for cities all over the world before he would even search for Luthor. Art - 3: Less effort went into the art for this story than in the other two both in terms of the base art and the 3D effects. The red and blue depth lines are random, which still makes it look like something is happening on the page. It just isn't clear what it is. It's obvious from most of the examples that rather than making effective 3D images with red and blue, most of of the drawings just have red and blue randomly sketched onto the pages. Many of the pictures are barely 3D, but occasionally depth differences can be perceived, just not very accurately. Second story - "Origin of Superman"
Superman's origin story is classic, but it has been told so many different times and in different ways that it can become hard to keep track of which facts go where. This time, it's a slightly updated version of the Golden Age origin from Action Comics #1, only it's in 3D. The planet Krypton began to experience earthquakes, so Jor-El told his fellow citizens that the planet would soon explode because the core was made of uranium, but they didn't believe him. Just before the big boom, he sent his only son Kal-El to Krypton's sister planet on the other side of the Sun, Earth. Once he landed on Earth, Kal-El and his rocket were found by the Kent's, an elderly couple who brought the baby to an orphanage saying they would like to adopt him. Once it became clear that the baby was "super" and he had broken a lot of things, the orphanage decided to speed up the process and give the child back to the Kent's as quickly as possible. Growing up, young Clark Kent discovered he could run at incredible speeds, could see through the solid objects, and was invulnerable. Young Clark's mother died first. Then as his surrogate father lay on his deathbed, he told his son, "You must fight evil ... criminals and outlaws. They must never know you are a super-man." And so Clark Kent became Superman. 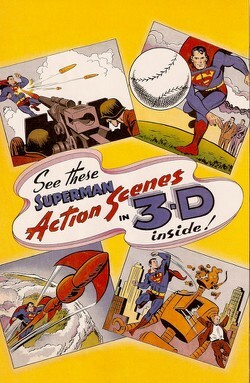 Story - 5: Superman's Golden Age origin in 3D. Art - 5: Huge improvement over the first story. The faces are clear and mostly differentiated from one another. The 3D mostly works this time, although the randomly inserted 3D text still takes some patience. Third story - "The Man Who Bossed Superman"
"The Daily Planet's Orphan Fund Contest: Superman will do everything the winner orders for one day, providing it isn't illegal." With a great deal of luck, Mr. "Pudge" Purdy, the racketeer, won the contest and could boss Superman around for 24 hours. First he demanded that Superman bring him the biggest hunk of ice he could find. Superman brought him a glacier, attempting to feign a mistake because Pudge meant a diamond when he said "ice." So Pudge restated his demand saying he wanted to biggest diamond in the world. So Superman constructed a baseball diamond for him. Next Pudge requested a ton of gold, so Superman dug a long tunnel to the ocean where he mainlined ocean water to Pudge's home, which he claimed was on part per million gold. Finally, Pudge asked Superman to get him the world's largest gun so that he could finish the Man of Steel off for good. So Supes drilled a long hole into the ground as the barrel and tricked Pudge into setting it off while they were still in the hole. From jail, Pudge's final order was for Superman to simply get away from him. Story - 5: This story was even more quaint than the first one, but it worked much better. Instead of a huge cosmic crisis caused by Lex Luthor, it was far simpler and got its point across in a fun and amusing way. 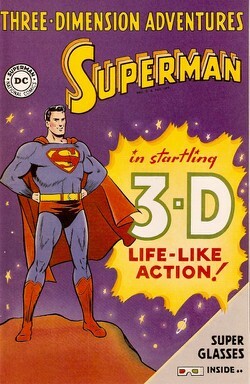 Art - 4: Superman's several labors allowed some wonderful opportunities to utilize the 3D effects. Many of the panels were beautiful and created a real sense of depth, while just a few failed to make a decent effect. Cover Art - 5: Simple is better. Considering that this was a 3D Superman comic, the concept sold itself, so there was no need to add splashes with text specifically describing the stories inside.